‘Gun Free Zones’ are lethal. That’s because every madman looking to rack up a body count knows that he will face ZERO OPPOSITION in these places, thanks to shortsighted politicians. In fact, over the last ten years, an incredible 300 people have been murdered in these so-called ‘Gun Free Zones’ in America, while 662 more received life altering wounds. And despite the fact that Wyoming has Stand-Your-Ground and Constitutional Carry law in place, it won’t matter if you are disarmed in one of these areas when you need your firearm the most! That’s why Wyoming Gun Owners is working to rid Wyoming of these deadly areas in 2019. We’ve recently produced this video report to let you know what’s going on, and how you can help! With the legislative session starting in just under two weeks, we need your assistance. First, please sign your petition in support of this legislation to make sure your lawmaker knows where you stand. 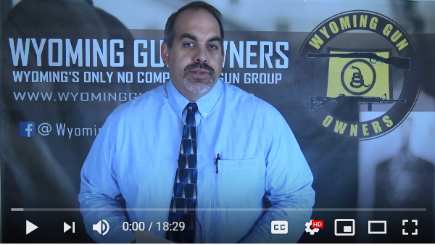 Second, please renew your membership in Wyoming Gun Owners in 2019 so that we have the resources we need to FIGHT! Wyoming stunned the nation last year, passing Stand-Your-Ground law just a month after the Parkland, FL shooting. But we can’t let up, not for a second. P.S. The 2019 session is just two weeks away, meaning our fight to get rid of ‘Gun Free Zones’ in Wyoming is about to kick off! Please see our video update on this fight here! And then please sign your petition in support of this legislation right away, using the link above.